Time Warp Mode engaged! Sunday, November 23, 2014 – We had a great weekend at the VA Comicon which was held at the Richmond International Raceway in Richmond, VA. I owe a very big thanks to my buddy, Ben Taylor, for putting FF on the program. In addition to a table at the show we held a panel during which the inaugural podcast version of Fantastic Forum was taped! I’ve been interested in launching a podcast for some time. The half hour format of the television program doesn’t permit in depth exploration of topics. Plus the way people consume podcasts lends itself to greater exposure for the product. We were surrounded by friends! Our table was situated directly adjacent to Awesome Con’s Ben Penrod and Joe D’Intino. Dan Nokes and Philip Jean-Pierre, both of whom are phenomenal artists, were setup nearby. And we got interviews with the likes of Steve Rude, Jae Lee, Christopher Inlow and Herb Trimpe! In fact, I had the added thrill of being able to give Herb and his wife, Patricia, a ride to the venue as we stayed in the same hotel. I’m thinking of having the seats bronzed. One of the highlights of the weekend was the opportunity to meet homeboy Joe Fiduccia. I call him homeboy because Joe is from Bloomfield, NJ not too far from where I grew up. And Joe is living a dream as the builder of a replica of K.I.T.T. 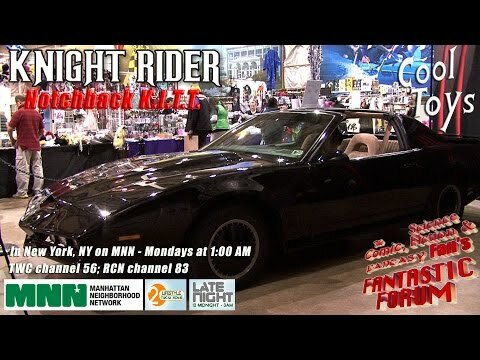 from the classic NBC-TV series KNIGHT RIDER!